LotFP: RPG: Rainville's Tales of the Scarecrow Cover! 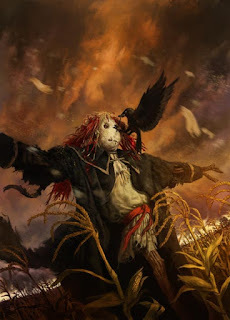 Rainville's Tales of the Scarecrow Cover! Nice. Very nice. Really liking the atmosphere in this artwork. Also realism, does anyone know of scarecrow that would have actually done it's job of scaring crows. It helps if you hang dead crows off them. If you look really, really close, is there a real a terrified eye in the face of the scarecrow? No, it's just a button. LotFP Store 2012 First Snow Sale!